These marijuana sweet rolls will stay fresh on the shelf for 3 - 4 days with only a light cover. No eggs, or milk are used and the butter has been clarified to oil for a very shelf stable recipe especially for cinnamon rolls. 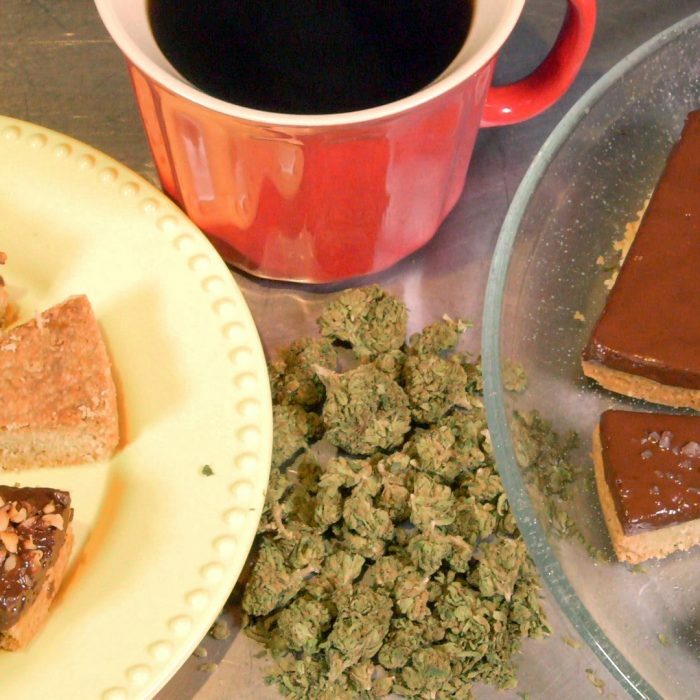 But don’t worry, the flavor is not compromised, it’s actually even better because the doubled amount butter oil melts out then absorbs back into the dough for a rich, gooey and and deliciously buttery dessert or paired with a cup of coffee in the morning for a decadent cannabis kick start. 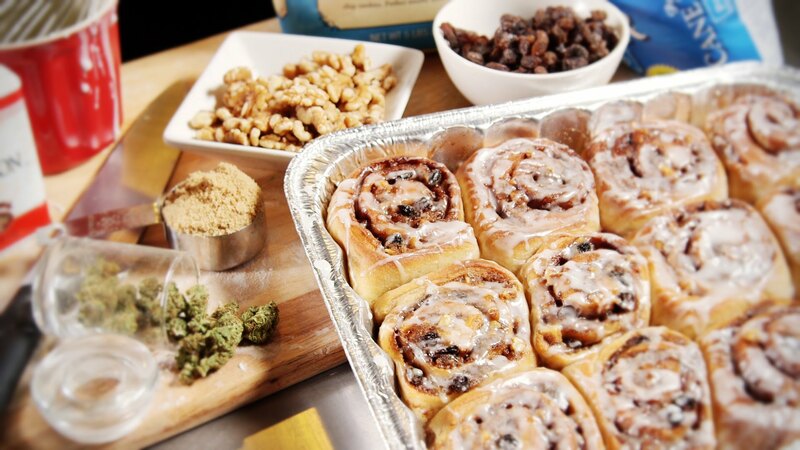 These marijuana sweet rolls will stay fresh on the shelf for 3 - 4 days with only a light cover. No eggs, or milk are used and the butter has been clarified to oil for a very shelf stable recipe especially for cinnamon rolls. 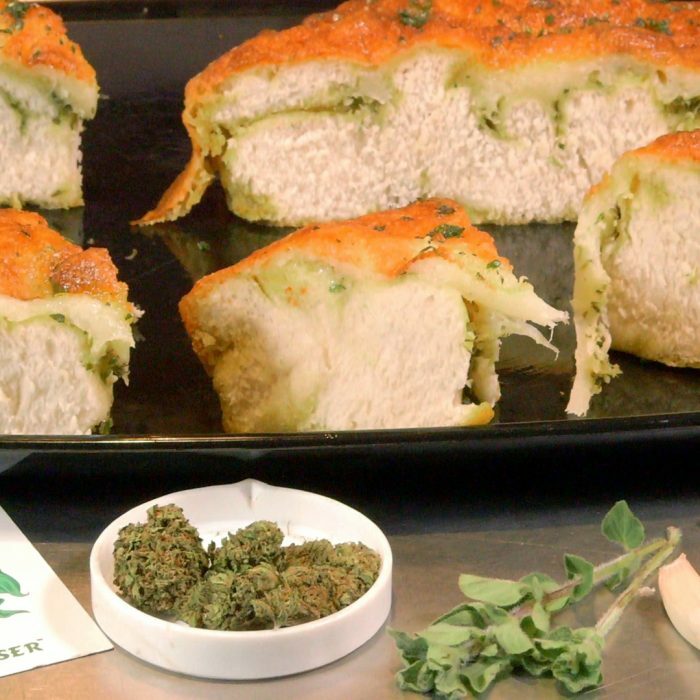 Place 1/2 oz cannabis, ground fine, stems and seeds removed on a baking sheet with some parchment paper beneath it. (Pre-crease your parchment for easier handling.) Bake in an oven on 225•F for 1 hour and 50 minutes. Clarify the butter by heating on medium heat and scooping out the white milk solids that float to the top with a spoon. Remove and heat until the butter is a clear golden oil and is reduced to about 1 cup. Strain the butter from the cannabis with a metal strainer or cheesecloth and let cool to room temperature. In a large bowl, dissolve the sugar in warm water, then stir in the yeast. Allow to proof until yeast reacts into a creamy foam. Mix salt and oil into the yeast. Mix in flour a little at a time beginning with the wheat flour. Hold back about 1/2 cup of flour for adding during kneading. Knead dough on a lightly floured surface until smooth. About 5 - 8 minutes. Place in a well oiled bowl, and turn dough to coat. Cover with a cloth. Allow to rise until doubled in bulk, about 1 hour or so. Punch dough down. Knead for a few minutes and let it rest for a few minutes under an inverted bowl. Mix the brown sugar, nuts (If desired), cinnamon and infused butter in a bowl until combined and smoothing, set aside. Shape the rested dough into a rectangle about 13” X 9”. (Use a cutting board as a guide.) Sprinkle the surface of the dough lightly with cinnamon. Then spread the sugar/butter mixture as evenly as possible across the entire surface of the dough leaving a little space along one long end clean to seal it. Roll the dough lengthwise into a tube. Wet your fingers with water and seal the exposed end, laying it on top of the roll and sealing it. Cut the roll in half lengthwise, then once again so it is 4 pieces. Then cut each section into 3 equal pieces trimming the last bits of each end as waste if desired. Form the pieces into oval or circles and place them at a slight angle to fit them into a 11” X 9“ pan. Bake at 350 degrees F (175 degrees C) for 20 minutes. When the tops are golden brown remove them from the oven and make the icing right away if adding it. To make the icing take about 2 cups of powdered sugar and whisk in just enough cold water to make a drizzle. 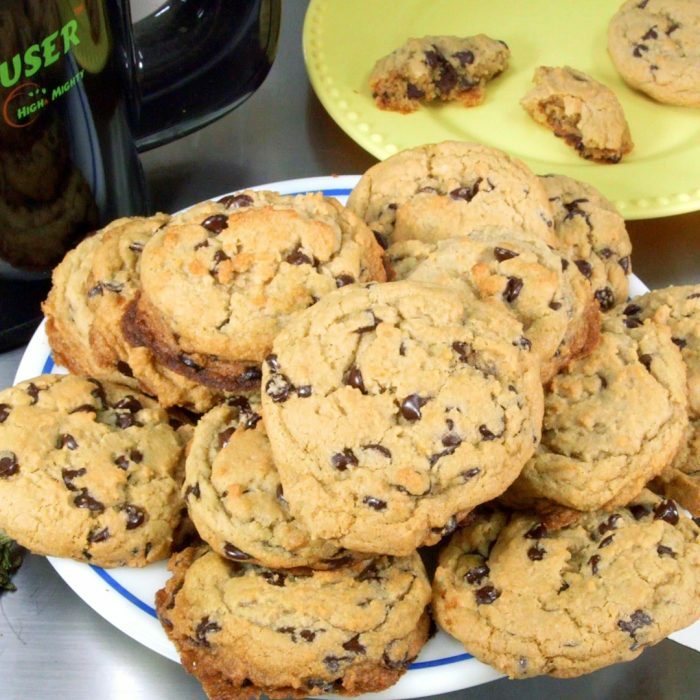 Drizzle as desired, let cool till a little warm, serve and enjoy. 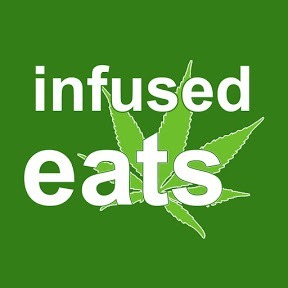 * For a twist, try infusing some orange zest into the cannabis and butter in the double-boiler step. How much cannabis is supposed to be used?